Here’s a detail that passed everyone by during NVIDIA’s GTX 1080 and 1070 reveal last week. In an uncharacteristic display from a graphics card company that obviously wants people to buy as many of their products as possible, they announced that they’d only be supporting 2-way SLI for their upcoming Pascal generation. Into high-end systems and ultra graphics settings? Let them loose on the best PC games around. What does that mean? Nothing as dramatic as it may sound at first. It definitely does’t mean they’ll somehow withdraw driver support for SLI on older cards. It also doesn’t mean you can’t buy four GTX 1080s and SLI them all together if you wanted to. 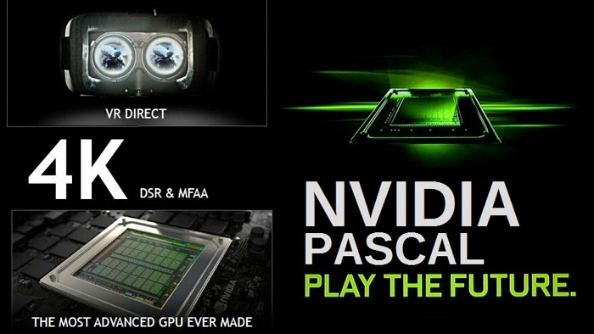 It just means NVIDIA aren’t worrying about optimising performance after a third card is added. It’s been that way for years, actually – run some benchmarks adding in an increasing number of GTX 970s and you’ll see hugely diminishing returns with three-way and four-way SLI setups. Occasionally you’ll even see a slight dip in performance with four cards all sucking from your PSU and your motherboard and CPU trying to make sense of it all. So the news isn’t that NVIDIA have dramatically changed their approach to SLI optimisation – it’s that they’ve come out and said they don’t recommend using more than two cards. As they announce the rest of the 1000 series lineup in the coming months, we’ll get a clearer indication of that position and its ramifications.